In the latest Housatonic Recommended Mating, we are throwing the “nick” rating out the window — for some very good reasons — and will be sending the recent acquisition Starr Gate to the intriguing young sprinter Buffum. Despite being by Mineshaft, who himself crafted a Horse of the Year campaign at 4 with seven two-turn Graded victories, including two at the classic distance of 1-1/4 miles, and who was a son of the renowned classic influence A.P. Indy, Starr Gate was a very fast sprinter who takes after her female family, which is full of quite quick runners. For instance, her dam, Stellar, was a debut-winning 2-year-old sprinting who then placed in a Grade 2 sprint in her second start, and at 3 won a 6-furlong stakes race. Stellar’s half-brother, Gygistar, won the G1 King’s Bishop and the G2 Riva Ridge, both going 7 furlongs. Their dam won once from two starts at 2, and she is out of the Grade 2-placed 2-year-old Ellie Milove, a Dr. Fager half-sister to Champion Sprinter Eillo. On top of all that, Starr Gate looks like a sprinter — she is close-coupled and stocky with very muscular hindquarters. Buffum, meanwhile, was a $1.2 million yearling who debuted at 2-years-old with a win at one mile, but his biggest career victory came at 4-years-old in the Grade 3 Bold Ruler Handicap, in which he covered 7 furlongs wire-to-wire in 1:21.68. He was described by trainer Tom Albertrani as the fastest Bernardini he ever trained, and he had many of them given his status as a trainer for Godolphin, who stands Bernardini and raced Buffum. And Buffum is also built a bit on the downhill, with a very large hind-end — though he is a bit leggier than some sprinters. So on proclivities and physicals this pairing makes a lot of sense, but the nick ratings do give pause, since TrueNicks calls this a “D” based on the cross of A.P. Indy-line sires over A.P. Indy-line mares (and indeed, 3×3 inbreeding to A.P. Indy, which this mating creates, has produced only 1.1% stakes winners, compared to the breed average of 2.4%). We have a theory about why A.P. Indy, though he was such a great sire, has not worked when he’s been inbred to — and it boils down to the fact that he was a true classic dirt influence, whereas the American racing game really does not cater to that type of horse any longer (outside of the Triple Crown races and the Breeders’ Cup Classic, and maybe a couple other races). So when you double up on A.P. Indy lines, you’re selecting for an aptitude that (except for basically those four races cited above) does not have an outlet in the current racing climate. We think it’s instructive that the best horse inbred 3×3 to A.P. Indy is the wickedly fast Coal Front, who went wire-to-wire in both the Grade 2 Amsterdam and the Grade 3 Gallant Bob, both times going 6 furlongs (although he did stretch out most recently to win the Grade 3 Razorback going two turns). And given the speed possessed by both Buffum and Starr Gate, plus the similarities created in this matchup to the pedigree of Coal Front, we think this is the perfect opportunity to go against a negative nick rating. 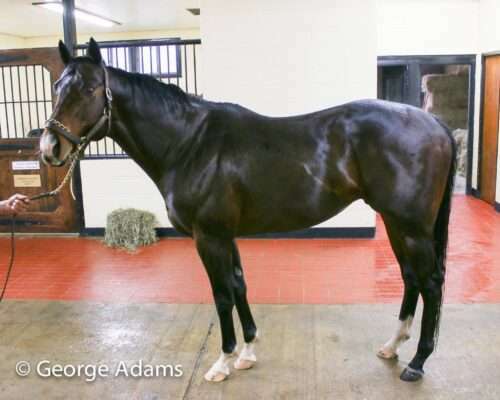 As we just mentioned, mating Starr Gate to Buffum will create a very similar pedigree to that of Coal Front, who is by Stay Thirsty (a son of Bernardini out of a Storm Bird mare, while Buffum is by Bernardini out of a mare by Storm Bird’s speed influence son Storm Cat), and out of a daughter of Mineshaft (like Starr Gate) with a second dam by a son of Mr. Prospector (Starr Gate’s dam is by a grandson of Mr. Prospector). Buffum also already has sired a winner from his only other foal out of a mare by a son of A.P. Indy, so that gives us confidence, too — as does the fact that Buffum is off to a very strong start at stud, albeit with quite limited opportunities. His first foals were 3-year-olds of 2018, and while he only has 15 named foals between his first two crops, two of them are stakes winners (good for 13%) and another is black-type placed, among the nine winners from eleven Buffum offspring to reach the races — huge percentages from a statistically small sample. Still, from just a 1.08 CI for the mares he bred, he has achieved a 1.76 AEI, meaning he’s moving his mares up quite a bit. His biggest winner so far is Clever Mind, who broke his maiden first-time out in the Maryland Million Nursery over more experienced rivals for trainer Graham Motion. Given all the above, we are very excited about this matchup, and hope it produces the quick and talented foal that we think it has the potential for.